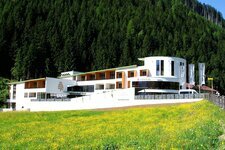 The holiday area High Tauern in East Tyrol, which includes the territory from Matrei in Osttirol to the Defereggental valley, is considered to be one of the original landscapes of Austria. The 150 km long mountain ridge extends from South Tyrol in Italy to the Salzburger Land in Austria. Some of the mountains of 3,000 metres are for example the Grossvenediger (3,666 m asl), the well-known Grossglockner (3,798 m asl) and the Hochgall (3,436 m asl). The High Tauern National Park is considered to be the largest protected area of Central Europe. This region is worth more than being visited only once - numerous educational trails provide useful information and maybe you even catch sight of a marmot, a chamois or an ibex! An insight into the culture of this country is provided when the farmers’ markets or other traditional events such as the cattle drive in autumn, with folk music and culinary delicacies, take place. Hopfgarten is located in idyllic position at the entrance of the Defereggental valley. The holiday village Matrei in Osttirol is the largest municipality of East Tyrol. The municipality Prägraten am Grossvenediger is very popular with alpinists. A great scenery surrounds the village in the Defereggental valley. The enchanting village of St. Johann im Walde is starting point for several hikes. In 2006 Virgen was voted “Europe’s most beautiful flower village”.